Our Fun Dives at Koh Chang | Thailand , should be exactly what they are called! Fun and Save! 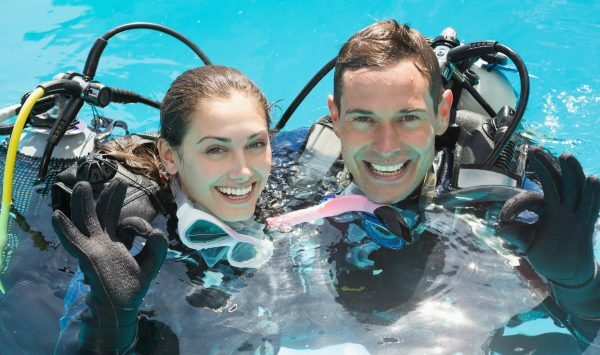 You as a Certified Diver decide how you would like to conduct your Dives. You like to follow our Dive Professional. Or you would like to scuba dive with your own Dive Buddy! We are around to help you! Purchase additional fun dives (2 per day) and get a discount. You are free to choose which extra days you dive once you arrive. Our Fun Dives should be exactly what they are called! Fun! You as a Certified Diver decide how you would like to conduct your Dives. You like to follow our Dive Professional. Or you would like to scuba dive with your own Dive Buddy! We are around to help you! BCD’s from APEKS, ScubaPro or SEAC. ScubaPro Go Fins, Mask, Tanks ( Serviced and Tested frequently) and Weights. Your Day of Fun Diving, starts with PickUp at your the Hotel. Our Cars will bring you to Klong Prao Beach(High Season). Or Bang Bao Pier (Low Season) where the boat will be Moored. Please be aware that in High Season! You will be boarded from the beach with our Dingy to the Big Boat ( YOU CAN GET WET). At Low Season the Boat will Park at Bang Bao Pier. The Boat leaves at 8.30 to 9.00 am and is doing max. 3 Dive Stops a Day (High Season Schedule). After the 2nd Dive we will provide Buffet Lunch on the Boat. Softdrinks, Drinking Water, Coffee and Tea are provided all Day. You will be Back at Klong Prao Beach or Bang Bao in-between 3.00 pm to 5.00 pm. The max. Dive Time will be 50 – 60 min. depends on the Group Gas Consumption, Depth or 50 bar. There are no Beach Dives at Koh Chang! The Divesites around Koh Changs West Side are max. 30m deep average dive depth is 15m of depth. At National Park. The Divesites are in average 10m deep. With one exception Koh Rang Pinacle is 25m deep. National Park Fee’s are 400 thb/Diver 200 thb/Snorkeler for Foreigners. And 240 thb/Diver and 40 thb/Snorkeler for Thai Nationals. National park fees are not included. National Park Fee’s have to be Paid in cash. The Captain will taking care about the Park Rangers. The Park Rangers will enter the Boat and collect the Fees.